Alban is at present eight years old. He is doing well and in good health. He attends the third grade at school and comes to our feeding programme centre together with his class friends. His favorite subject at school is Mathematic and his preferred color is blue. During the afternoons when he is freed from his school homework, he likes to play football with his friends who live near his home. Alban like to be a well-known football player when he grows up. Alban started to attend the feeding programme at Katjel every Tuesday and Friday and enjoys the combined meals cooked and served to the participating children. He likes the fried chicken, sausages, pasta and rice served by our cooks. Alban attends the Bible classes for the children who are same age with him and enjoys singing to praise the Lord Jesus and learning from God’s Word through the Bible stories. At the end of the Bible lesson, he and the other children spend time to play football at our feeding centre under the care of our teachers. A free dental care will be offered to him once a year by our dentist. 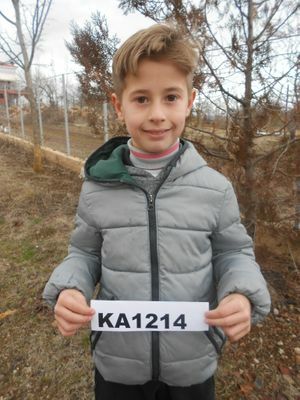 Alban lives with his father, mother and has a sister whose name is Aleksandra. She is fifteen years old. She is also attending school and frequents the feeding programme. Alban’s can’t support all the needs of the family working in the lands they own only therefore he is emigrating and working each year for eight months in Greece for the people who hire him to do construction. What he earns is well, due to the hard kind of the job he does. Emigration remains the only secure financial source. The mother does the housekeeping especially while her husband is working far from home. The mother will plant as usually in spring the vegetable garden. They profit by working in the lands fresh vegetables for self consumption. The family has no animals as the father due to being away can’t plant to provide the stock food to them.